The modules are available with up to four independent electrically isolated CAN interfaces designed according to ISO11898. The intelligent boards are equipped with powerful microcontrollers. CAN data is stored in the local memory with a guaranteed data security and consistency of up to 1 Mbit/s for all channels simultaneously. Among many other features the bit rate can be set by software. Most of the interface boards are available as CAN FD version. 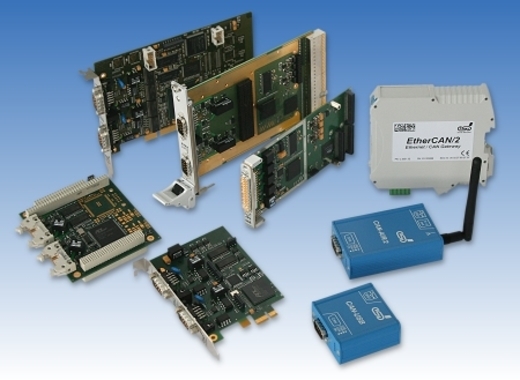 Most standalone CAN controllers available today are connected to the host system by eight or sixteen bit wide parallel buses. Write and especially read accesses to such peripheral devices are very slow compared to the cycle time of modern CPU's. ACC reduces the performance bottleneck and shows a solution, using a CAN controller implemented in an FPGA that can use bus master DMA. CAN/ CANopen drivers are available for Windows (32 and 64 bit), RTX, Linux, VxWorks, QNX and others. For these operating systems there are also OSI-level2 drivers available. Comprehensive diagnostic and monitoring tools are included in the scope of delivery. Firmware updates can be loaded from the website and installed via PC.